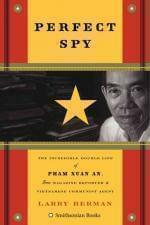 During the Vietnam War, Time reporter Pham Xuan An befriended everyone who was anyone in Saigon, including American journalists such as David Halberstam and Neil Sheehan, the CIA's William Colby, and the legendary Colonel Edward Lansdale—not to mention the most influential members of the South Vietnamese government and army. None of them ever guessed that he was also providing strategic intelligence to Hanoi, smuggling invisible ink messages into the jungle inside egg rolls. His early reports were so accurate that General Giap joked, "We are now in the U.S. war room." In Perfect Spy, Larry Berman, who An considered his official American biographer, chronicles the extraordinary life of one of the twentieth century's most fascinating spies. This is an interview with Larry Berman conducted by guest host Ron Yates, Dean of the College of Communications at the University of Illinois, who reported from Vietnam during the war for the Chicago Tribune.